Dr. S. Gunasekaran, Ph.D., D.Sc. St. Peter’s Institute of Higher Education and Research, Avadi, Chennai – 600 054. Former Registrar, Periyar University, Salem. Former Head, Department of Physics, Pachaiyappa’s College, Chennai – 600 030. Dr. S. Gunasekaran was born on 3rd June 1954 into an agricultural family in the remote village of Kathiyavadi in Tamil Nadu. He pursued Under Graduation in Physics in the Tamil medium at Presidency College, Chennai. He reached St. Joseph’s college, Trichy for his Post Graduation. He has registered for Research at MIT, Anna University. At the time of submission of his thesis, he had forty publications to his credit. His assiduous and prolific research work has more recently, in October 2011, earned him the apex of degrees Doctor of Science- D.Sc. from the University of Madras. Dr. Gunasekaran, Dean (R&D) of St. Peter’s Institute of Higher Education and Research, St. Peter’s University, Avadi, Chennai, began his teaching career at the Pachaiyappa’s College, Chennai, in 1978 and remains a dedicated Teacher to this day, his forte being Electronics and Microprocessors. But Dr. Gunasekaran was restless to do more, than just teach a syllabus, so he went about promoting research activities in the department by garnering funds to equip the Laboratory with instruments for research. As Dean (R&D), he took support from the Management of St. Peter’s University and he has established Sophisticated Analytical Instrumentation Facility (SAIF-SPU), housed with advanced spectrophotometers. His area of Research is the Application of Spectroscopy in varied fields that are likely to yield results beneficial to society, like Materials Science, Medical Physics, Environmental Science and Molecular Dynamics. In fact, recognizing the powerful tool that Spectroscopy can be in Physics research, Dr. Gunasekaran has coined the term – ‘Spectrophysics’. Till date, Dr. Gunasekaran has successfully guided 75 candidates who have obtained their Ph.D. in Materials Science, Medical Physics, Environmental Science and Molecular Dynamics. He has to his credit, more than 404 publications in reputed journals and has h-index as 30 and i10-index as 106 with 3947 citations. He is also extending his meritorious service of being referee of many reputed journal. He also has 3 filed patents to his credit. Dr. Gunasekaran has a credit of founding an association, in November 1998, called ‘Indian Spectrophysics Association’ with the acronym ISPA, a registered society under whose auspices, conferences, workshops and seminars are organized. Dr. Gunasekaran has an enviable record of having organized 7 International conferences and 12 National Conferences. He has organized 15 State Level Technical Seminars in Physical Sciences for PG and M.Phil. students, since 1999. This act as a great fillip to students to pursue research and also compete for the ISPA-Dr. Gunasekaran Award, ISPA Awards have also been instituted to honour eminent Scientists in the field of Spectroscopy, which are being presented annually at these Seminars and Conference. Dr. Gunasekaran has also rendered great service to the School Education Board of the Government of Tamil Nadu, by serving as a Member of the Syllabus Revision Committee and Chairperson of Book writing committee. He has authored 14 books for Higher Secondary Physics, Secondary Science and Environmental Education, in both Tamil and English medium. Dr. Gunasekaran had the honour of being selected for the post of Registrar, Periyar University, Salem, and this administrative post, he served with verve and vigour for the full term of three years from August 2008 to August 2011, proving that his administrative skills were no way inferior to his scientific skills. Given his keen interest in research, he did his best to sustain research activities at Periyar University and with the approval of the Syndicate, sourced funds from donors, to institute four Sir CV Raman Awards, two each for students and faculty, in order to kindle their research thirst. He also made it a point to organize National Science Day celebrations every year on the 28th of February. The sincere and dedicated hard work fetched him many Awards right from his Post Graduation. 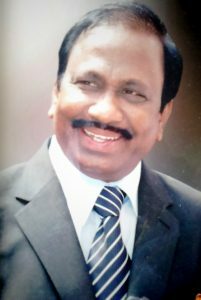 More recently, Dr. Gunasekaran is honored with the most prestigious Tamil Nadu Scientist Award 2013 for Physical Science by Government of Tamil Nadu. He is honored by Elsevier journals with Outstanding Reviewer Award. He is conferred on Life Time Achievement Award by the University of Madras and the Elavenil Organization during International Symposium on Crystallography and Advanced Materials (ISCAM 2018), in March 2018. He is also honored with Life Time Achievement Award by the AMET University, Chennai in March 2018. Dr. Gunasekaran is also conferred with other awards viz., Eminent Educationist Award, Best Citizen of India Gold Medal Award and Indo Global Research Excellence Award by various reputed organizations in the year 2017. In September 2016, he is conferred with Award for Research Excellence by Indus Valley Foundation, USA. In August 2016, he is bestowed with Bharath Ratna Rajiv Gandhi Gold Medal Award for his participation and contribution to research and society by Global Economic Progress and Research Association. Dr. Gunasekaran has bestowed with Ariviyal Kalanjiyam Award 2015 by Mayilai Thiruvalluvar Tamil Sangam, Chennai. He has obtained Best Physics Student Award during the course at St. Joseph’s College, Trichy. Many awards have been conferred on Dr. Gunasekaran in the light of his dedicated service to Teaching and Research, to mention a few, Award For Excellence in the Spheres of Academic, Research and administration in August 2013 by Sri Vidya Mandir Arts and Science College, Uthangarai, Tamil Nadu. He is awarded for his achievement in the field of Higher Education by St. Joseph’s College in Josephites Re Union 2013, Trichy. Dr. Gunasekaran was conferred with Life Time Achievement Award during National Conference on Recent Advances in Applied Sciences (NCRAAS 2012). Dr. Gunasekaran is awarded with “Best Teacher Award” by Lion’s Club International and Pachaiyappa’s College, Chennai. He was conferred on “Eminent Scientist Award” in 2010 by Sree Kanchi Kamakodi Peetam, for his outstanding contribution to Science and Technology. He is awarded with “Research Guide Achievement Award” for his outstanding research in the field of Spectroscopy; the “Psychometric Educational Services Award” by The GCC School of Creative Intelligence and Research Foundation Trust for his valuable services and contributions to Human Resource Development; a “Certificate of Appreciation” for the successful conduct of the unique technical seminars for PG and M.Phil. students at the X State Level Technical Seminar in Physical Sciences in 2008; a “Certificate of Appreciation” by the Journal Spectrochimica Acta in 2007. “Life Time Achievement Award by National College (Autonomous) during Centenary Celebrations of National College, Tiruchirapalli. It is very evident, that from humble beginnings, Dr. Gunasekaran has come a long way, achieving all that he has, and if he stands tall today, it is only through sheer dint of hard work, honesty, sincerity, perseverance and self confidence. As a result, his panoramic insight in the research has brought him a prestigious Tamil Nadu Scientist Award (TANSA) in Physical Sciences for the year 2013.